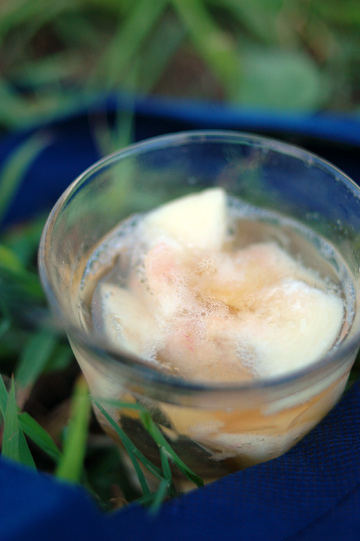 I have noticed that at around this time last year and the year before the last, for two years in a row, I did write-ups about how I ate peaches during the summer. And comes the end of August this year, with me having stuffed myself up with succulent fresh peaches for the whole month. While I'd eat most of them simply as is, I have turned some into some sorts of desserts (and drinks), so here they go. 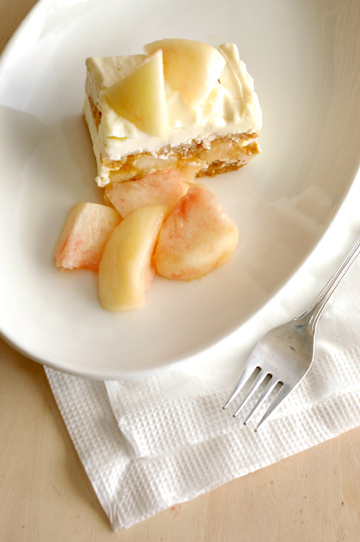 Just about a month ago, when I was about to make Peach Tiramisu using this recipe, I happened to be meeting some friends the following day. So I thought I'd make it and might as well bring it for them to share. As I started preparing it, it occurred to me that one of the folks can't have coffee; okay, I substituted a mixture of strong black tea, orange juice, and Grand Marnier for the espresso and rum, to turn it into Peach & Tea Tiramisu. When it was done, I suddenly remembered that another one of them doesn't like cheese! Alas my plan just wouldn't work, okay, no, I'm not going to take this with me, I decided. They weren't missing out anything though, as I went with some Pierre Herme desserts instead. 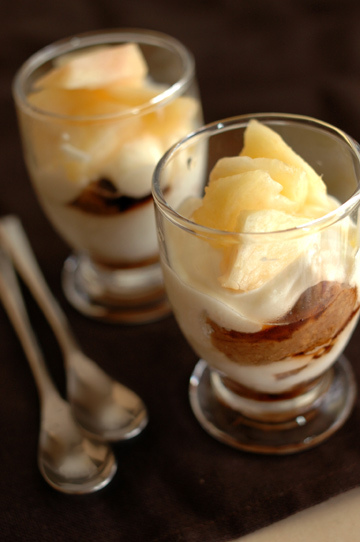 This is on the easier end of tiramisu recipes, calling only for dunking finger biscuits in the espresso mixture, layering them with slices of fresh peaches and a mixture of mascarpone cheese and heavy cream. I had never quite thought of pairing peach with coffee, but this turned out just fine; my personal preference would be the one flavored with tea and orange, but my family gave a better review to the coffee version. Everyone's got their own taste, and it seemed that the both versions were quite good, so all good. Peaches and champagne. Peach must be one of the fruits that go the best with champagne, I am tempted to believe - although strawberries may be just as good, I must admit. 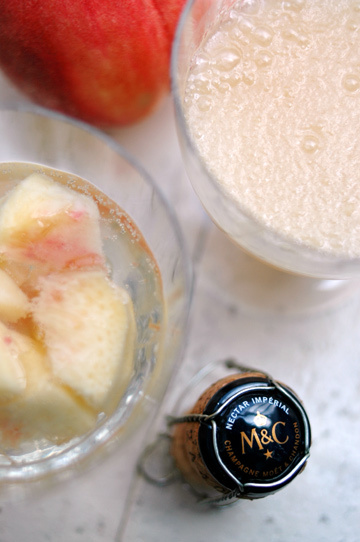 I fixed a Bellini and a simple peach & champagne with Moet & Chandon Nectar Imperial, an unusually sweet champagne that could even make a dessert wine. 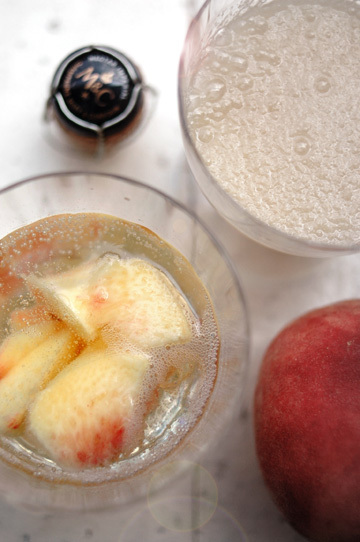 Normally, you'd add some syrup to Bellinis, but you won't need it here; both the wine and peaches here were sweet enough to require no added sweetener. The champagne of course tasted lovely as is, specially in lazy early evenings of summer - pleasure! 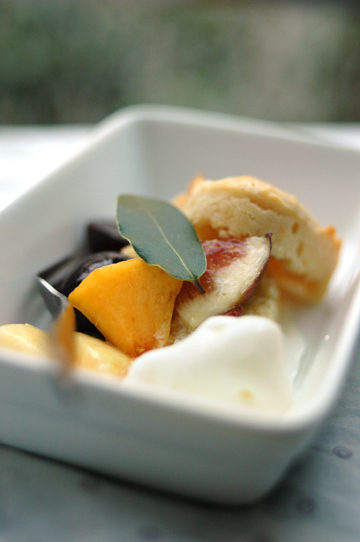 Champagne Summer Shortcakes, recipe featured by Heidi over at 101 Cookbooks. The idea of dressing ripe summer fruits with honey-champagne syrup sounded alarmingly good, and so it looked in her eye-catching shot of the dessert. For the syrup, I omitted the sugar and simply paired champagne (not the sweet one but a regular dry kind) with my favorite Hawaiian white honey (this one goes beautifully well with bubblies). In making shortcakes I attempted to give it the scent of fresh bay leaves, which I also used for the ice cream, which, basically, worked well although I would have liked it better if the scent of bay leaves had been little more pronounced. Other than white and yellow peaches, I used figs and grapes - all really ripe - and the fruits in the syrup alone were addicting. And now the summer comes to a close, I still have some lovely juicy peaches around, but there are far too many peach recipes I have bookmarked to try while the season lasts; well I'm probably going to have to devour them straight away while saving the recipes for the next summer, and I'll tell you what, I'd most likely to be making some of them and write up at around this time next year. We'll see. Oh my goodness! All of these recipes look divine! I share my love for peaches with you and I can proudly say that I've done my fair share of peach-stuffing this summer as well! Beautiful desserts... can I have some? it's this time of year that's incredibly painful for me - as i developed an adult allergy to peaches about 6 or 7 years ago. reading this entry and walking through the union square farmer's market 3 times a week on the way to work is pure torture!!! p.s. nice little feature in venus magazine! Or in the above recipe, of course! Too much gorgeous content for one post - i think i'm becoming hungry. I don't know what to say except STUNNING. 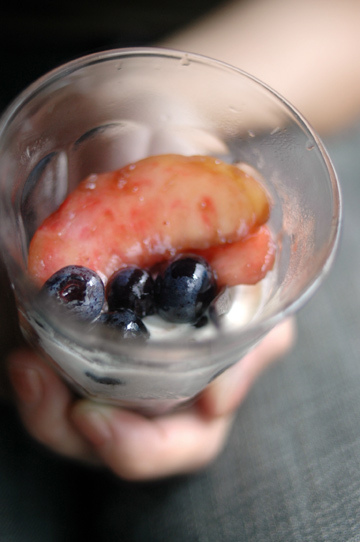 peaches are my favourite fruit so I was drooling as I read through your post - YUM!! Unfortunately I still can't get over the price of fruit here in Japan so I rarely buy peaches. Have to say fruit here tastes 10x better than back home (nz) though! that hawaiian white honey is incredible. never thought to pair it with champagne. Thanks for the inspiration. Your photos make me long for the white peaches that grew on my parents tree. Tiny little things. But such flavor.